I have cycled past, and run past, and walked past this old barn thousands of times. I didn't know I still had the postcard until it turned up inside a book I have not looked at for some years - The Life and Opinions of Tristram Shandy - a book I never could finish. 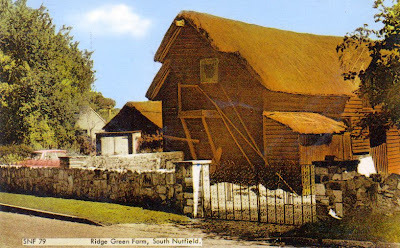 Back to the postcard: something strange has happened to the barn at Ridge Green Farm, South Nutfield. It looks as though it is fading.